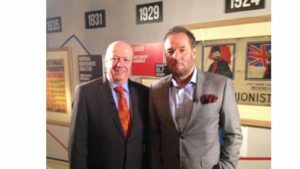 In 2015, Rob was awarded the Scoop of the Year in The O2 Media Awards for a 30 minute ITV ‘Party People’ special revealing that Derek Hatton had re-joined Labour 29 years after his expulsion as a member of The Militant Tendency. The special, part of Party People which he presented for more than 10 years from London and Manchester on Granada Television (later ITV Granada) made headlines for today’s on TV, Radio, Newspapers and online. Labour, responded by blocking Hatton from obtaining a card. In this ITV News page he talks exclusively about his life in Militant, his politics and his view of politics in the 21st Century.